Enshrined in the First Amendment to the U.S. Constitution as fundamental human prerogatives are “the right of the people peaceably to assemble, and to petition… for a redress of grievances.” The amendment expressly banned Congress from abridging that right. A century and a half after the young nation guaranteed its people those rights, the General Assembly of the United Nations declared in the Universal Declaration of Human Rights that all people were entitled to the same freedoms. Since then, those rights—“peaceably to assemble… [and] petition for a redress of grievances”—have come to be held as virtually sacred. Often, when they have been publicly abridged in any part of the world, public opinion has been quick to condemn the responsible governmental entity, sometimes with powerful effect. In the United States alone, two such event chains substantially changed the nation’s political complexion in the 1950s and ’60s. The U.S. left lost strength in 1956, when a large proportion of the Communist Party USA left the party in disillusion after the Soviet Union’s brutal suppression of Hungary’s anti-communist movement. On the other hand, a few years later, the dogs-and-fire hose police responses to civil rights demonstrations in Southern communities—and the international shock as those responses were broadcast on television around the globe—were a major factor in the passage of the Civil Rights law of 1964. Worldwide, it was the “banning” and imprisonment of South Africans for challenging apartheid as well as the ugliness of apartheid itself that galvanized world opinion against the South African state from the 1980s through the arrival of nonracial-based democracy there in the early ’90s. And the Communist world was never the same after the global revulsion at the deaths of protesters in Beijing’s Tiananmen Square in 1989. Now, this year, the Arab Spring and its children are sweeping the globe, from Cairo’s Tahrir Square to New York City’s Wall Street. Around the world, people are exercising their right to assemble, demanding participatory democracy and people-centered economic priorities. As I write this, the protests are arriving in Washington DC. Two weeks ago, in New York City, Palestine exercised the other half of that right: the right to petition peaceably for redress of grievances—in this case, a grievance going back to 1947 and the U.N. partition of Britain’s former Palestine Mandate into a future Jewish state, a future Palestinian state, and a shared Jerusalem. The State of Israel was formed in 1948, but Palestine to this day has only “observer” status at the United Nations (despite recognition of its sovereignty by 65 percent of U.N. member nations). There are several possible outcomes. 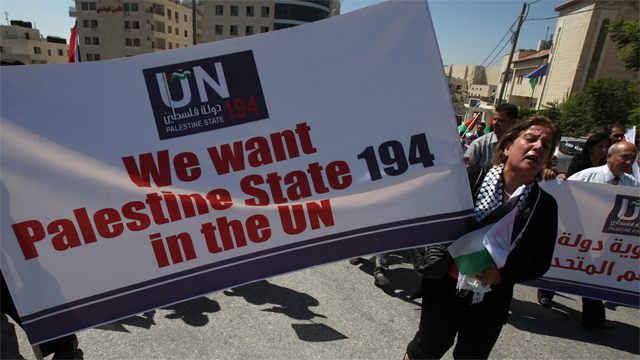 If the General Assembly recognizes Palestine statehood, the Security Council would then approve or disapprove the decision; the United States will then veto statehood on behalf of its ally, Israel. The General Assembly could then vote to give Palestine an intermediate status, that of “observer state.” That decision would also face U.S. and Israeli opposition but would not be subject to veto. Leave Israel aside, for the moment. A U.S. citizen, I write this for a U.S. audience, about what our representatives are doing. Members of Congress have suspended payment of unspent monies allocated for Palestine in the just-ended fiscal year 2011; and bills presently before Congress regarding fiscal year 2012 provide draconian penalties for Abbas’ and the Palestinian Authority’s daring. For one of the many attempts to stop this, see the U.S. Campaign to End the Occupation. I liked up to you will obtain carried out right here. The caricature is tasteful, your authored material stylish. nevertheless, you command get got an edginess over that you would like be handing over the following. sick indubitably come further before again since exactly the same just about a lot often inside case you shield this hike.